When Prometheus, Ridley Scott’s much anticipated Alien prequel arrived in theaters, it was met with claims of ‘gorgeous,’ ‘fascinating’ and a lot of ‘what the hell?’ So it’s no wonder 20th Century Fox promoted the DVD and Blu-ray versions with the tagline, “Questions will be answered.” And the studio is right, somewhat. It’s science-fiction, horror and philosophy rolled into one. And perhaps that’s part of the problem with the film. The science is too vague, the horror isn’t scary and the philosophy doesn’t come to any conclusions or have any real logic behind it. 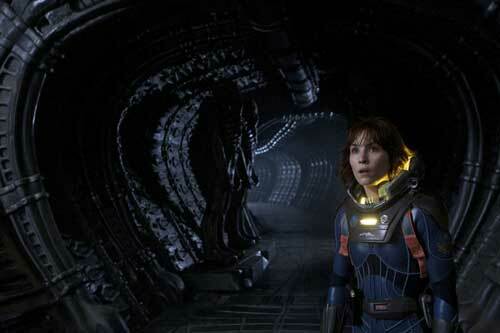 The best parts of Prometheus are the performances and the visuals. True to form, Scott created a movie that looks stunning. The landscapes of Earth are beautiful, and the designs of the humans’ ship as well as the alien planet are fascinating. By themselves, they’re enough of a reason to watch the film. And with Blu-ray’s high definition, all the detail looks amazing. The movie’s cast is top notch too, with good performances from all the core players, including Charlize Theron (Snow White and the Huntsman), Guy Pearce (Lawless) despite terrible old man makeup, Noomi Rapace (Sherlock Holmes: A Game of Shadows), Idris Elba (Thor) and especially Michael Fassbender (A Dangerous Method) as the creepy cyborg. Unfortunately, some of their best scenes aren’t in the movie, which makes me grateful for the Blu-ray. The disc contains a bunch of deleted scenes that are arguably more watchable and interesting than many parts of Prometheus itself. Especially good are the scene with Theron’s captain and her father Pearce, and the extended version of Pearce talking to the Engineer. Both offer insights to the characters and their motivations that are missing from the final film and would have helped make it more enjoyable. The deleted scenes are offered with commentary, and editor Pietro Scalia (The Amazing Spider-Man) tries to explain why some of the scenes were cut. About that very interesting ending sequence with the Engineer, he said, “Ultimately, the decision was that the less the Engineer says the better to keep it more mysterious.” Which would be fine if this wasn’t near the end of the movie and the audience hadn’t been asking WTF for the past hour and an half. But as Scalia went on to explain about their editing choices: “It’s always a question of balance, and should the audience understand it.” Well, in this critic’s opinion, it’s generally best if they do. The collection of deleted scenes, which are fully finished and edited with placeholders from the movie to show where they would have been, are by far the most interesting special feature offered on the Blu-ray. It would have been even better if they had been playable with the movie as a full extended version (although there are plenty of scenes in the film that could have been replaced with these to make the final more entertaining). My guess — hope — is that Scott will re-edit Prometheus one day, because I think there’s a much better movie in here with the right cuts. Maybe that’ll be offered on a future Blu-ray release. Scott has his own commentary for the full film, and it ranges from dull (telling us what’s happening on the screen) to laughable (telling us that sometimes you just have to say “f*ck off, that’s what I want” when directing a movie). The other commentary, with writers Jon Spaihts (The Darkest Hour) and Damon Lindelof (Cowboys & Aliens), is perhaps more interesting, especially for those interested in writing screenplays as well as the influences behind the movie’s story. At one point, Lindelof talks about wanting Prometheus to be a mashup of Scott’s original Alien and his legendary sci-fi opus Blade Runner. The disc also offers a strange section called “The Peter Weyland Files,” which has some interesting parts, such as a commercial for Fassbender’s David model of cyborg and Rapace’s video call to Pearce’s Weyland, but the rest is a mixture of vignettes with other characters and scenes of research, maybe (clips of people from around the world, landscapes), that gets boring. Despite Scott raving about the film’s visual effects in his commentary, there’s no extras devoted to their creation, which would have been good considering they were the best part of the movie. What extras there are do answer some of the questions the film left viewers pondering, as promised by Fox’s ads. But the Blu-ray still doesn’t completely satisfy, leaving the most important question — why the Engineers wanted us dead — unanswered. But that’s for the prequel sequel to take care of. Hopefully it’ll do better than this first movie.